A blue and white city bus screeches to a halt at the intersection of Greeley and Eastwick, a busy corner that funnels traffic from Jameson Airport and the Hanover Bypass. The FCTA logo on the side of the bus is freshly painted, and the bright autumn sunlight glints off its well-scrubbed surface. All the maple and oak trees along Greeley have already began to shake off their vibrant red leaves, blanketing the sidewalk in a pleasant crimson hue. He slips the card back into his pocket, readjusts the duffel bag, and walks south on Greeley under the swaying trees. Liam suddenly stops after one block. The kwoon is just how he remembers it. 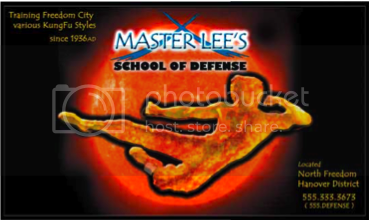 A non-descript two-story building in grey concrete, with a modest sign hanging over the front door that reads Master Lee's School of Self Defense, written in fanciful red and gold script. A roaring dragon coils around the letters. The buildings next to the school are much more gergarious, built in the Colonial Georgian style in red brick and contoured frames. Liam smiles, thinking of the Old Man's humility and grace. He walks through the door. Inside, a da sihing leads a small group of sihing in a series of drills. Each punch and kick is accompanied by a piercing shout. Liam watches them and soaks in the kwoon's ambience: worn red mats cover the floor, wooden dummies and stands holding polearms and swords line the walls, and arches made in the traditional Chinese scrollwork extend from each corner of the room and meet in the center of the ceiling. Box windows at the front allow the rich light to illuminate the room. Despite it's plain exterior, the kwoon's interior has an elegant and simple design. A lone sihing sits on a bench, stretching his legs. Liam approaches him. Today, he's come to see Master Lee for a specific reason. However, the name "Master Lee" is just a marketing ploy. Although the Old Man never cared for honorifics, Liam knows to call him sifu. "Hey. Is the sifu here today?" he asks the sihing. The lone sihing looks up at Liam with a smile and says "Oh yes, Sifu Lee is upstairs with the advanced students." This one is a somewhat newer student and is not familier. It seems he is wearing an orange sash, clearly he has not been here long. "Are you looking to become a student here?" Ah, a new student. He reminds me of myself when I was his age. "Um, not exactly," replies Liam with a friendly smile. "I'm an old student of his. I was here a few weeks ago. Y'think it's alright if I go see him?" "He is not involved in any testing so I would imagine it would be alright. I don't see any reason it wouldn't be." Liam excuses himself and walks across the room to the staircase leading to the upper floor. He climbs the stairs and finds himself in a room much like the one below. A cloud of incense hovers in the air, filling the room with a sweet, pungent odor. Liam surveys the scene, looking for Sifu Lee. Liam observes Master Lee instructing four students in a medium intensity sparring match with one student defending against three attackers. Even though Master Lees back is to the stairs that Liam just came up, Master Lee calls his student forward. "Enter Liam unless the knowledge you seek is at the peak of the stairs." he says with a little humor in his voice. Liam smirks upon hearing the Old Man, his words completely disarming him. He never ceases to amaze me. He drops his duffel bag at the doorway and slowly approaches Master Lee. For most students, Lee has a calming effect on them. At this moment, though, Liam is struck by an intense anxiety, as if he is approaching Lee for the first time. His heart racing, Liam greets Lee with a deep bow, his palms pressed together. "As always, it's an honour to see you, Sifu. I, um, I am in search of knowledge. But you knew that already. May I have a moment of your time, in private?" "Of course." He turns to his other students "Halt. Please assist the lower students for a few minues." The four student bow then decend to the lower floor. "Now...to what knowledge do you seek? Is your spirit lost?" "It's . . . it's complicated, Sifu," replies Liam. He takes a few moments to find the words. "I was defeated by a man who became an ally to my cause. He is a great warrior, so I don't begrudge his victory. It's just . . . "
His voice trails off, the well-rehearsed sentence somehow vanished. He clears his throat. "Sifu, you are one of the few people who know my secret. This man who had beaten me, Benjiro, said you informed him of my training. Not just here, but from all over. I . . . I was under the impression that no one should know of that, in case they could connect me to him." He casts his eyes downwards. I must know! "Why did you tell Benjiro these things? Now he knows my secret."